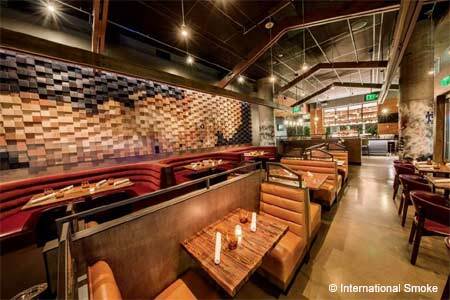 Consistently creative fare in an equally impressive SoMa setting. 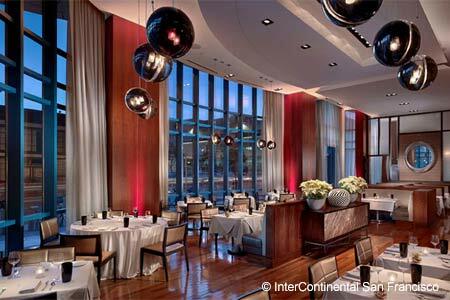 : Located at lobby level in the InterContinental San Francisco, Luce inherits the cathedral-height ceilings affordable only to an ultra-premium hotel. (The restaurant’s logo and name are also inherited, in this case from a joint venture between the Frescobaldi wine family and California winemakers, the Mondavis.) The sophisticated dining room combines rich taupe tones, an exquisite marble floor and glittering, hand-blown, hanging orb lamps. Chef Daniel Corey continues to be as expressive on the plate as the setting is in its grandeur. Opt for a six-course tasting menu (available Tuesday-Saturday) to fully experience his vision. Clean, fresh flavors persist across an eclectic set, and highlights include an earthy velouté of Jerusalem artichoke, deftly matched with Fiorelli pear and dusted almost imperceptibly with cocoa. A smoky foie gras “chaud et froid” (hot and cold) incorporates sweet compressed green apples and pistachio. Wine pairings are thoughtful, and selections tend to span the globe far more than one might expect given the restaurant’s dual-family winemaking origins. Dessert of crackly chocolate stout cake with toffee and malted coffee does not disappoint.